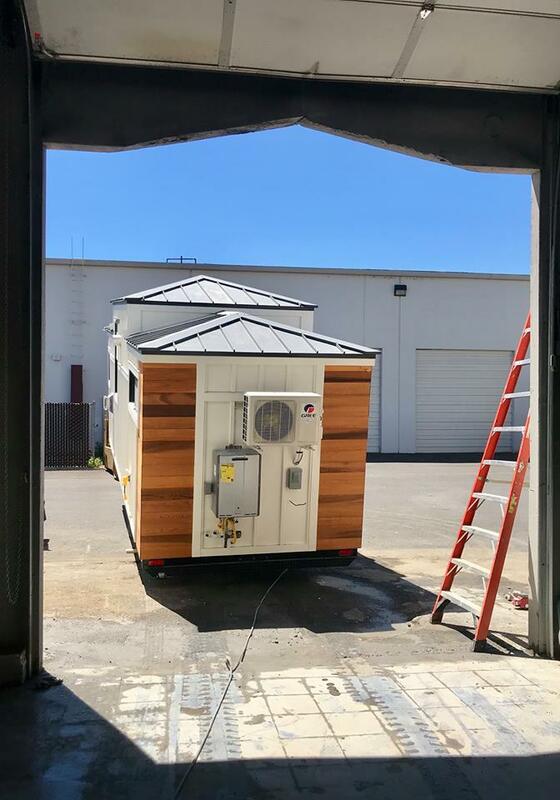 This is the story behind "Amelia" - the Tiny House with a Big Dream, about how I was chosen to design and manage this collaborative build, and a theatrical bow to all of the amazing people who made it possible. Being involved with this project has honestly been the experience of a life time. I never imagined that living in a tiny house would bring me so much joy, independence, and so much opportunity. Amelia's first taste of sunlight! But first, a word for our sponsors…. 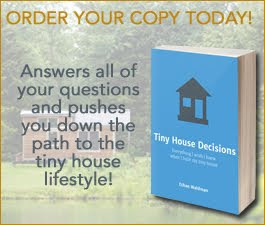 Below you will find the extensive list of who helped with building the Tiny House with a Big Dream. The owners of these companies and their staff have given of their time, their money, and their products. But most of all, they have given from the heart. Working with these generous and talented men and women have given me a renewed sense of community. Yes, there have been challenges. This IS a building, after all. But, despite it all, these sponsors have hung in there with us, returned more times than they originally committed to, collaborated on how to solve issues that arose, followed up, showed up, and manned up. And they have put their best foot forward, understanding the importance of the goal, the design aesthetic, our benefactors, and of how impactful this will be for so many. 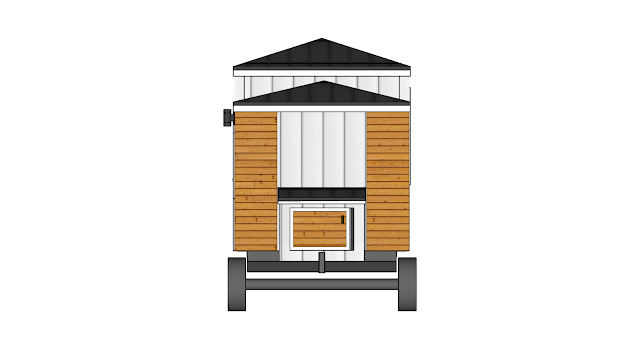 An early rendering of Amelia; The Tiny House with a Big Dream. Over the past 5 months, collectively, we have put almost $140,000 worth of products and labor into this 204 square feet. These sponsors gave, not from their dusty backrooms, but from the best they have to offer. Their sense of humor (truly needed for this build!) as well as their support and passion for this tiny house on wheels has been greatly appreciated and awe-inspiring. 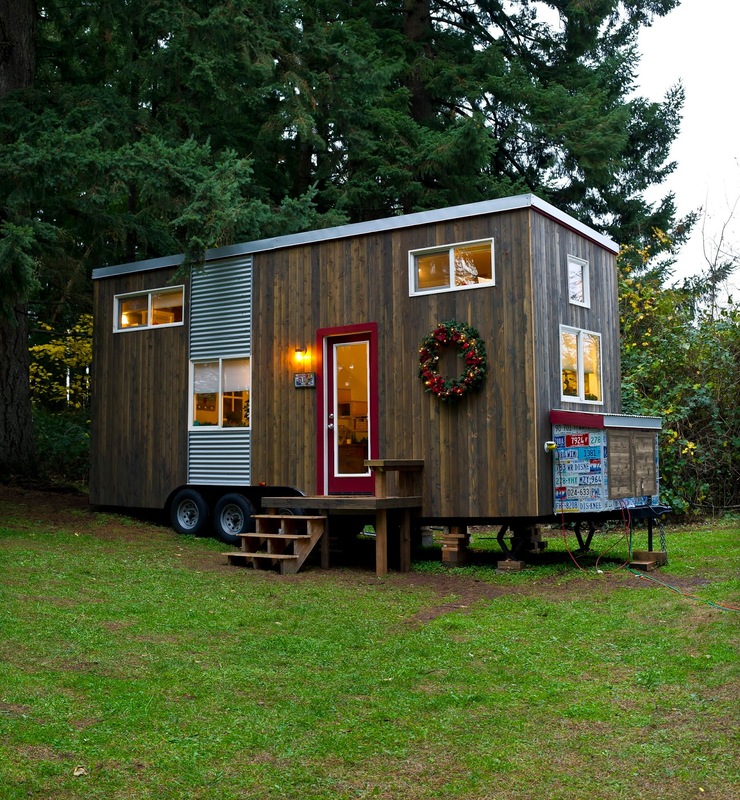 After spending over a dozen years as a single mom, I came to the conclusion that living in a tiny house after my children moved out, would help me prepare for and live comfortably in retirement. However, my paycheck to paycheck existence had not provided me with the ability to save money for retirement OR a tiny house. As such, I realized I would have to find a alternate way to pay for my first tiny house; later named “My Tiny Empty Nest”. $35,000 and 15 months later, My Tiny Empty Nest was done. During the research phase of my build, I discovered a book that introduced me to the concept of sponsorship. At the time, there were only a relative few tiny houses under construction and most people I talked to had no idea even what a tiny house was. This also meant, however, that there was an opportunity for product suppliers to partner with, and an opportunity for me to help them advertise their products in this very unique and rapidly growing market. Late in 2015 I finished my first build with the help of my boyfriend Mark, 22 generous corporate sponsors, and the cash I earned by “flipping” a vintage RV, selling refurbished furnishings, and taking on odd jobs and projects. 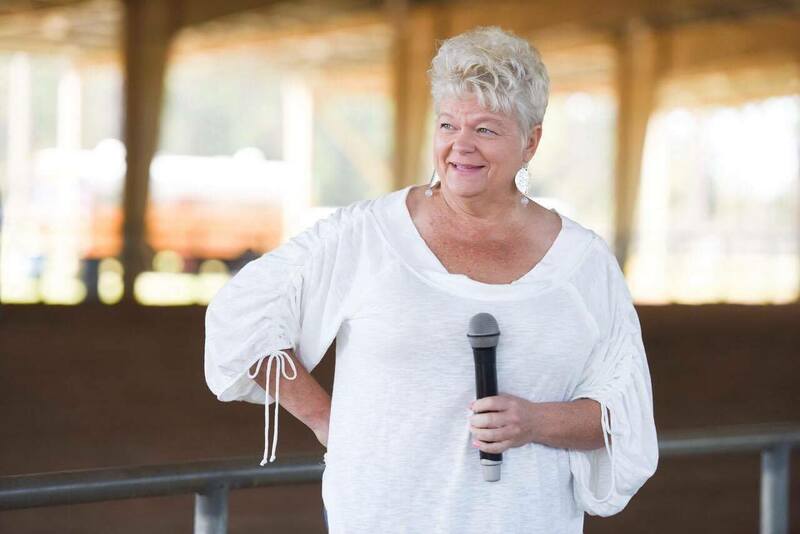 I also attended the first annual Tiny House Jamboree in Colorado and met a group of like-minded people that later provided me with a stage, and a mic, and a platform to tell my story. With a mic, a script, and a stadium; I'm good to go! Also during 2017 I decided that my ultimate future in tiny houses would not be as a builder or a speaker, but as a hostess of my own tiny house village. My plan was to design and build 4 tiny houses over the span of 4 years, and to rent them out as short term vacation rentals, or to anyone wanting to “try on” the tiny house lifestyle. And build I did. 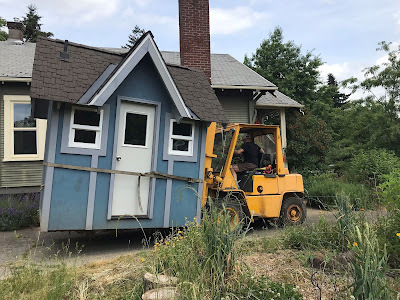 Again, with the support of Mark and over a dozen mostly-local sponsors, we started building both my 2nd and 3rd tiny houses in the span of 6 months. 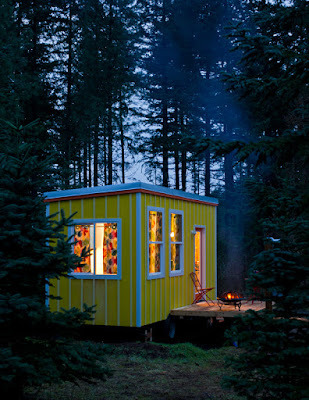 Tiny house #3: "My Tiny Hideout". Whew…..2017 was a busy year! And it was also when I met Gerald from Westlake Development Group. We had been introduced by a mutual friend, we met to chat over lunch and share our passion for building. We had a fun time comparing notes, and it was there we found a common thread of desire to pay it forward; to the Veterans community as well as the tiny house community. To simply say that working with Gerald has been an honor, undermines the real importance that his advocacy has played in this project. 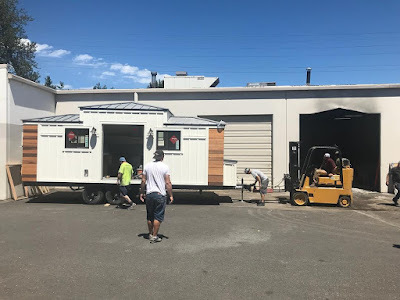 To say that Gerald is influential, is not words enough to describe the number of generous and supportive people he has recruited to help build this tiny house that will help so many. And to say that Gerald is a leader, does not pay homage enough to his dedication to helping Veterans. 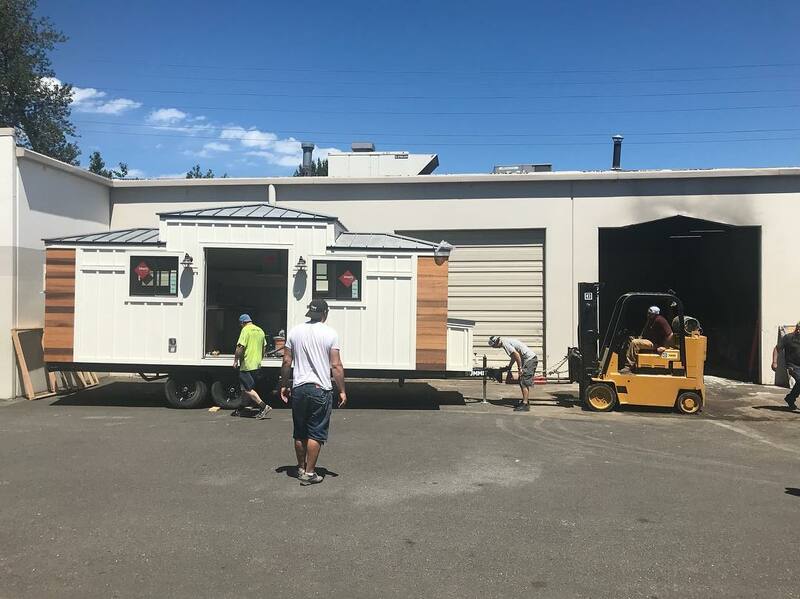 It was his idea to incorporate the tiny house into the Street of Dreams, to promote the auction of this beautiful project to help Veterans, and to inspire people to lend their hands and hearts to the amazing results. From that day that Gerald and I first met to discuss the project, to the delivery at the 2018 Street of Dreams, would be less than 5 months. 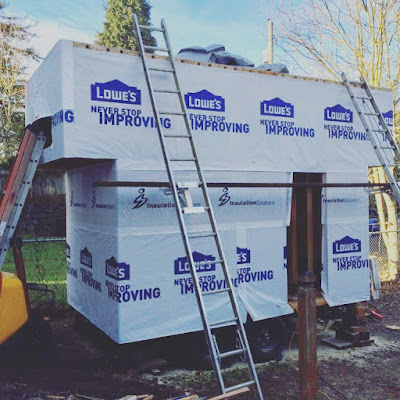 I would need help, and a LOT of it, to build a tiny house using only donated money, labor, and materials. But first, I needed a design…. The original design of “Amelia” was simple. The floor plan was inspired by both “My Tiny Empty Nest” and my first short term rental; “My Tiny Perch”. It was deemed easily doable but it was also TOO simple. After a bit of reflection, I realized that the design was more reflective of my subconscious desire to live inside my comfort zone than of the expectations of the Street of Dreams organizers and attendees. Thankfully Mark, my best friend, framer, and boyfriend; knows a lot about complex design and building and was there to lend his best ideas. 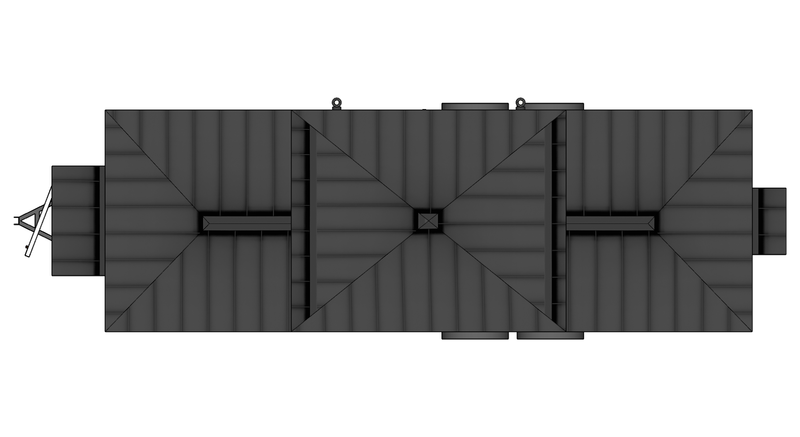 Mark's brainchild, this amazing roof line! 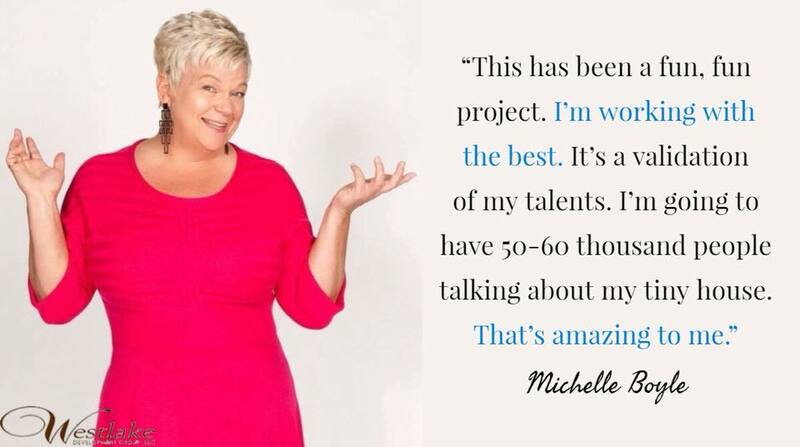 When I tell people this was a “collaborative” project…that was only the beginning. Jeremy and Ryan with Tiny Innovations are “never say no” kind of guys. Knowing that, you now know why I chose them and their team to join Gerald and myself on this crazy adventure. 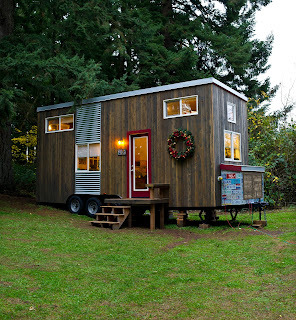 Theirs and their crew’s knowledge about tiny house building for the masses, filled the gaps in my tiny house experiences of designing and building tiny houses for myself and my village. And with such a short timeline, having a back up to the sponsors would be the true key to this project’s overall success. 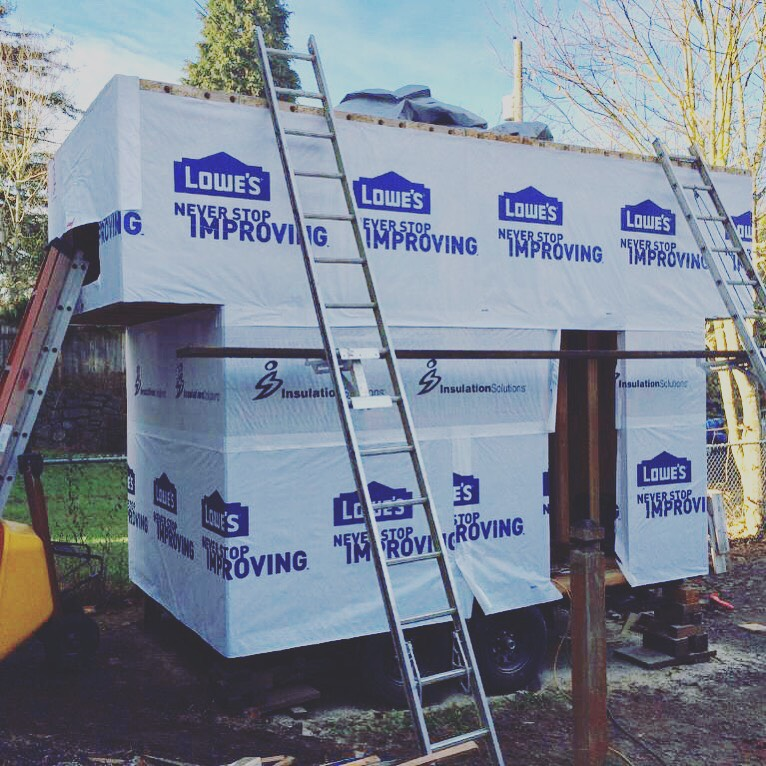 Two BIG guys, one tiny house company! Their warehouse provided me with a secure (and secret!) place to build where we’d never have to consider the weather into our timeline. Their enthusiastic crew was fun to work with and even more fun to drink beer with. 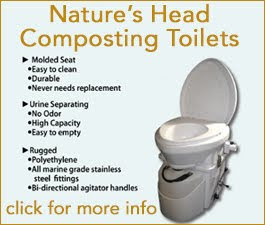 And their resources were invaluable when it came time to consider the “what next” for this design. And last, but certainly not least, the role that the Home Builder’s Association and its staff members has played; has been instrumental in pulling together this tiny dream with a BIG to do list! Every single one of them has been friendly, encouraging, helpful, and they have introduced me to a whole new world of opportunity. I entered their office as an outsider and now I visit as an esteemed colleague. Their feedback has validated my direction, sustained my vision, and given me hope that this will be a successful and welcome addition to the Street of Dreams. This not-so-tiny project is the culmination of my fascination and ongoing involvement with design, building, sponsorships, speaking, hosting, and writing. And now that we’re wrapping up the final details of the build, it’s time to put my thoughts to paper…. I am writing this on July 4th; a day when our country celebrates the anniversary of their independence. Today, however, I am also celebrating a different kind of independence; the financial freedom that living is a tiny house has afforded me. Door too short? No problem! But more importantly, I celebrate the opportunity to give back to those who have given so much to our country; our Veterans. During the Street of Dreams, well over 50,000 people will have the opportunity to view, and BUY the Tiny House with a Big Dream. So tiny, so much to offer. But since we don’t want ONLY our visitors to have a chance to enjoy Amelia, we’ve developed an online auction website where anyone can sign up and bid. 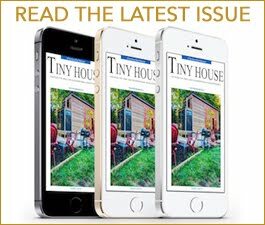 Step 1: Scan the QR-code at the Street of Dreams or go to www.tinyhousewithabigdream.com and enter your basic information so we know how to reach you at the conclusion of the auction on August 30th, 2018. Considering this home’s value, the minimum bid of $78,000 is a true bargain. 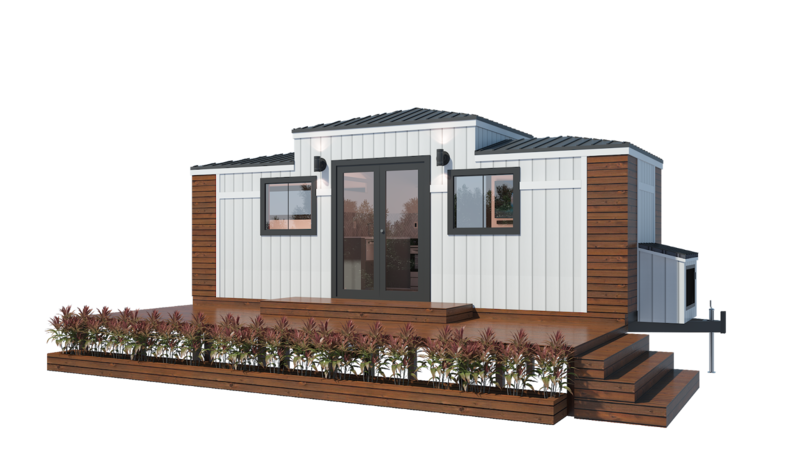 Step 2: Enter your credit card information and make a $50 donation to the Tiny House with a Big Dream Project. Step 3: Submit your bid. You’ll receive an initial email giving you more information about your donation as well as a follow up email if someone else outbids you. If that happens, a link will be provided for you to make another bid, but no additional donation is required since you’re already signed up! While all of this craziness has been going on, “My Tiny Perch” (my short term rental) has been a popular place to stay. I am both proud (and tired) to admit that keeping up with the growing demand has been a daunting challenge; but I have done it and received 5 Star Reviews from EVERY visitor. I eagerly look forward to returning to the days of “just” working a normal work week at my job, and managing my guests and their expectations. My 2nd tiny house and first rental; "My Tiny Perch". I am also proud to announce that, ahead of my self-imposed schedule, I have recently added a 2nd rental option. “My Tiny Bird House” is a minuscule 48 square feet of cuteness in the woods with an outdoor shower, bunk beds, breakfast included, and a deck for bird watching or just relaxing with friends and family. Discovering how I can fit so much into so little space, and watching my guest's reactions, will be immensely entertaining...to say the least. for their ongoing support, generous cash contributions, and personal advocacy. Amazing story, can't wait for the movie!